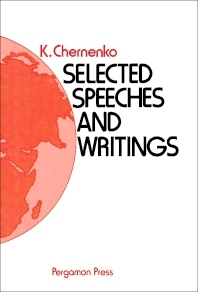 Selected Speeches and Writings contains Konstantin Chernenko's selected speeches and writings. Some of his writings are entitled, "The Leninist Strategy of Peace in Action," "Communists in the USSR," "For Lasting Peace and Dependable Security in Europe," and "Trust and Cooperation among Nations-The Guarantee of Peace and Security." His speeches include those presented at a ceremonial meeting on the occasion of awarding the Order of the Red Banner to the borderguard unit of the Red Banner Eastern Border District, on August 16, 1979. Other speeches presented at a Soviet-Bulgarian friendship meeting at the telephone and telegraph equipment factory in Sofia, on December 5, 1979, and at a meeting in Havana with students and teachers of the Lenin Boarding School are included as well.